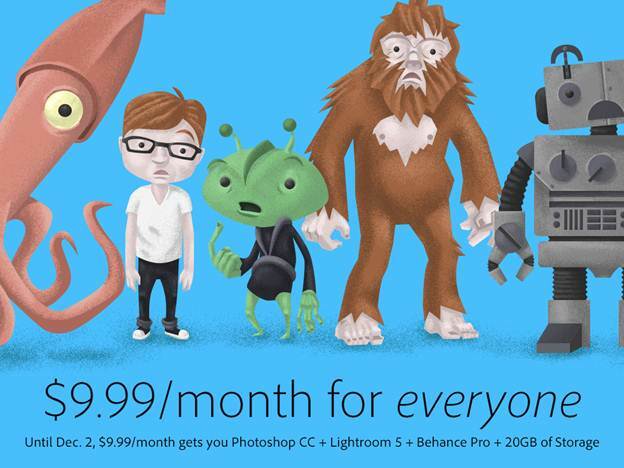 The Program offers access to Photoshop CC and Lightroom 5 (plus respective feature updates and upgrades as they are available), 20GB of cloud storage and Behance ProSite, all via Adobe Creative Cloud all for $9.99/month as an annual subscription. Upon the expiration of this limited offer, the Photoshop Photography Program will continue to be available for $9.99/month to those photography customers who own a previous version of Photoshop Photoshop Extended, or Creative Suite, version CS3 or later (CS3.x, CS4, CS5.x, or CS6). This offer expires Dec. 31, 2013.